Door Express Kelowna | Kelowna, BC Wood doors, french doors, panel doors, metal doors, and fiberglass doors supplied by Doors Kelowna for new residential and commercial projects. 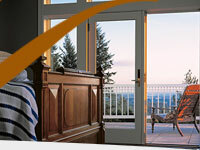 Welcome to Factory Direct Doors Web site specifically designed for our okanagan door customers and product lines. Our finished product is doors. Our expertise is impeccable workmanship, exceptional selection of product, extra-ordinary design, considerate style, and professional solutions to your building requirements. The Okanagan climate creates certain challenges for doors. Extremes of heat which effect internal humidity on south and west exposures, moisture concerns with snow drifting against the bottom of doors exposed to the wind, and certain applications somewhat unique to the lifestyle of the area. Lakefronts, wineries, pool decks and gardens all have their specific requirements that our reps understand. From bifolding exterior walls up to more than 16 feet wide, to round top doors and jambs, Laminated glass and double acting doors for sound studio's and media rooms, our expert staff can ensure what you envision is created and implemented to your specifications. If you don't see what you would like on our site, call us. This site is in constant upgrade mode with more than 20 products being added each day. If it exists, or imagined, we can actually do it. The range of products available for construction today is exceptional. From simple paint grade flat doors to carved doors in Fir, Maple, Cherry, Mahogany, Sapele, and Walnut, and short doors for wine cellars, tall doors for gymnasiums, and wide doors for ATV's, we have them all, or we can build them for you. What we are really good at however is service. Our professionally trained designers are experts in doors and thier use in residential applications. The team can walk you through the selection process, the opening requirments, the finishing, installation and use of each of our products. Our primary goal is 100 percent accuracy at the job site. Our people are dedicated to making that happen for you. Copyright ©2010 by Doors Kelowna. All rights reserved. Website production by Department of MIS, Factory Direct Doors.